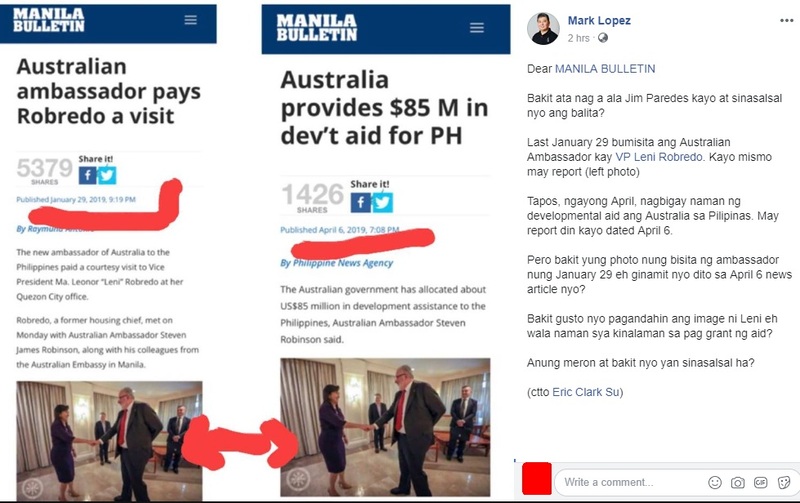 Veteran blogger and radio host Mark Lopez slammed one of the country's most popular national daily newspaper Manila Bulletin for allegedly promoting Vice President Leni Robredo and for their alleged biased reporting. Mark Lopez called the attention of Manila Bulletin staff for their alleged biased reporting after they used the same photo of VP Leni Robredo during the January 29 visit of Australian Ambassador to VP Leni and when the development aid from Australia, they used the same photo. The veteran blogger questioned Manila Bulletin why is it that the newspaper used the same January 29 old photo and was posted online also during the April 6, news article of the Manila Bulletin. Bakit ata nag a ala Jim Paredes kayo at sinasalsal nyo ang balita? Tapos, ngayong April, nagbigay naman ng developmental aid ang Australia sa Pilipinas. May report din kayo dated April 6. 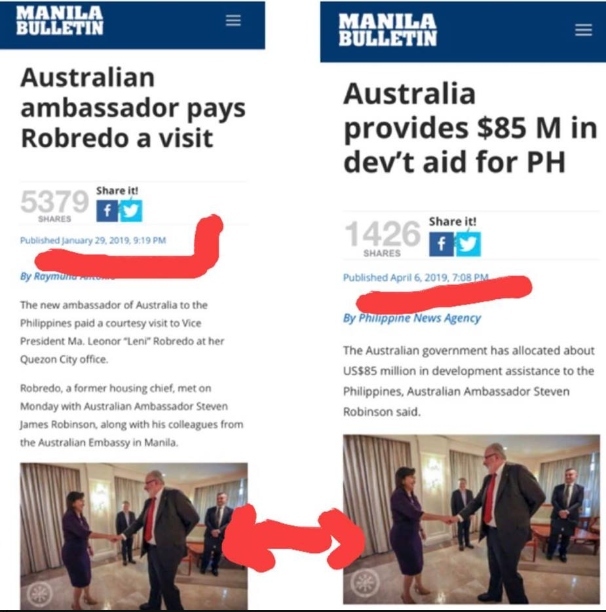 Pero bakit yung photo nung bisita ng ambassador nung January 29 eh ginamit nyo dito sa April 6 news article nyo? Bakit gusto nyo pagandahin ang image ni Leni eh wala naman sya kinalaman sa pag grant ng aid? Anung meron at bakit nyo yan sinasalsal ha?